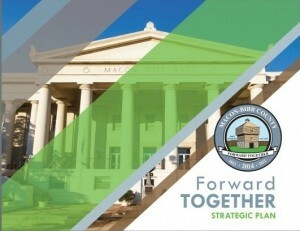 Since January 2014, Macon-Bibb County worked with the University of Georgia’s Carl Vinson Institute of Government to develop its first Strategic Plan. This process lasted more than a year and involved multiple retreats, work sessions, and meetings with department heads, organizations, and stakeholders. The planning process was funded with a grant from the John S. and James L. Knight Foundation. The Strategic Plan was rolled out as part of the presentation for the proposed Fiscal Year 2016 budget, and hard copies will be available by the end of May. To view a copy of the Strategic Plan, click here. The first-ever Strategic Plan helped develop the consolidated government’s new Mission and Vision statements, as well as five Strategic Focus areas that are helping focus service delivery, programs, and initiatives: Economic and Community Development; Safe Neighborhoods and Safe Communities; Efficient and Effective Government; Infrastructure Improvement; and Quality of Life. The new Strategic Plan was the driving force behind the development of the proposed FY2016 budget, which was presented to the Commission on May 12. Included in that proposal are full implementation of the new pay scale, elimination of double taxation, and a capital improvement program focused on strategic projects. To read more about the budget and see that presentation, click here.